Paul quits, National Siblings Day, catfish skyfalls into Florida pool, asteroid to miss Earth, Ford develops crib that emulates a car ride. Today is Monday, April 10, the 100th day of 2017 in the Gregorian calendar, with 265 days remaining. Passover begins this evening and ends Tuesday evening, April 18. KGB Report's on spring break for the remainder of the week. See you next Monday. 1,381 days until the end of Donald Trump's term as President, assuming he doesn't resign or is impeached. 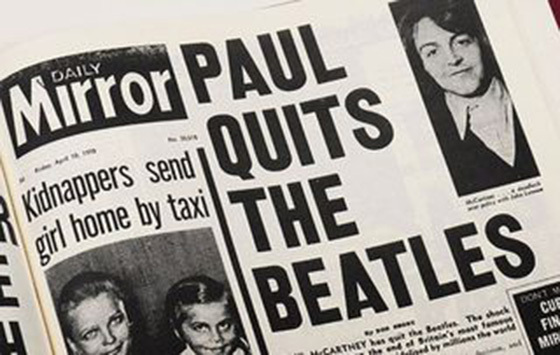 On this day in 1970, Paul McCartney announced he was leaving The Beatles. He filed suit for the band's formal dissolution on December 31, 1970. More legal disputes followed as McCartney's attorneys, his in-laws John and Lee Eastman, fought Lennon's, Harrison's, and Starr's business manager, Allen Klein, over royalties and creative control. An English court legally dissolved the Beatles on January 9, 1975, though sporadic lawsuits against their record company EMI, Klein, and each other persisted until 1989. Among other things, today is also National Siblings Day honoring the relationships of siblings. Unlike Mother's Day and Father's Day, it is not federally recognized, though the Siblings Day Foundation is working to change this. Since 1998, the governors of 49 states have officially issued proclamations to recognize Siblings Day in their state. Catfish falls out of the sky, lands in Florida couple's pool. Fortunately not falling from the sky will be a big asteroid that will sweep past Earth on April 19, 2017. It'll come so close- and it's known so far in advance- that scientists will be able to study the space rock using both radar and optical observations. The flyby should also be visible in amateur telescopes. Dallas officials blame computer hacking for setting off emergency sirens throughout the city early Saturday. Rocky Vaz, director of Dallas' Office of Emergency Management, said that all 156 of the city's sirens were activated more than a dozen times. Officials don't know who was responsible for the hacking, but Vaz said "with a good deal of confidence that this was someone outside our system" and in the Dallas area. Which begs the question- why would you design a system that communicates in such a way that it can be hacked? You'd think public safety infrastructure would be "air-gapped"- isolated from access via the Internet or similar means. Ford has designed a crib that simulates a car ride, helpful in keeping a baby quiet, and keeping sleep-deprived adults off the highways. Google says its custom machine learning chips are often 15 to 30 times faster than standard GPUs and CPUs. Google calls them "Tensor Processing Units." How about SkyNet? It's one thing to find a bug in your pre-packaged salad. But a bat? Infection with a retrovirus, a common but otherwise harmless virus, can trigger the immune system response to gluten that leads to celiac disease, according to new research from the University of Chicago and the University of Pittsburgh School of Medicine.